The crew and I are back where we started a year ago. I love the lush green of the Sonoran Desert. That’s right, a desert that’s lush. I look forward to taking many photos to show you how beautiful it is here. This post is short because I’m very sleepy after a full day. Tomorrow I’ll write more and catch up. Judging by the way Bridget and Spike reacted upon being let out of the PTV, I think they remember Darby Well Road and are glad to be back. 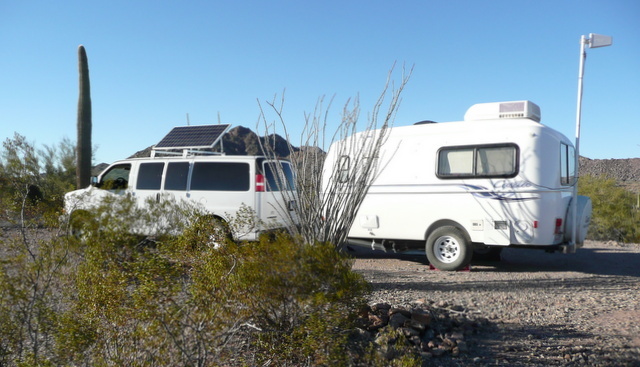 This entry was posted in Simple living and tagged Ajo, casita, Chevy Express van, Darby Well Road, desert, RVing, solar, Sonoran, Tow vehicle, Wilson antenna. Bookmark the permalink. 43 Responses to Goodbye Yuma, Hello Ajo! Glad it feels like home, Sue. Can’t wait to see pictures and read posts! This place speaks to me! here I am first again. looking forward to lots of pictures of the desert in all it’s glory. Glad the trip was good. sleep tight, don’t let the bedbugs bite. Yes, the desert in all its quiet glory . . . I love Saguaro cactus……had a lamp and dining room chairs made from the skeletons. Sadly southwest decor doesn’t go well in this neck of the woods. Found them good homes before we left Caleefornia. When you get a moment…I need the zip code please. c/o General Delivery, Ajo, AZ 85321-9999 Thank you! We woke up with snow up to our eyeballs! We have to shovel out….and wait for the snowplow to clear the road. I’ll let you know when the package is enroute. Probably won’t be today! Hopefully you’ll be there for awhile. Oh, I’ll be here for a while. This is too good to leave. Sun shining, birds tweeting . . . oops, sorry about that. . . Hope the snowplow doesn’t fill up your driveway! Rub it in….TYVM! The plow always throws the snow INTO the driveway. As soon as the plow comes…we go up there and dig it out immediately…if not it hardens so bad the blower can’t get thru it. Right now…we do it all by hand. With that………….I just got back from the PO. It’s coming priority mail (little box) and should be there in 2-3 days. Monday is a holiday so don’t make a trip to town too early. Thanks! And I appreciate the reminder about the holiday. I didn’t think of it. Welcome…..hope you brought warmer weather with you. How long are you going to be here, Pat. Maybe we could get together! I plan on staying until sometime in March. This is a great place to spent the winter and I like being in a very small town. Let me know if you want to meet somewhere or you can stop by my rig anytime you are out and about. I’ll email you in a few days. I saw the title of your latest blog post. Haven’t read it yet, too much to do on a travel day… Hope all went well across the border. I went back and read a few post from January 2012. Loved the blog about aliens…strange things do happen in the desert. Once I heard a loud whooshing sound from above with a very large dark shadow traveling FAST but no lights visible at all. A few seconds later got a call from cousin who lives five miles away w/same sound & shadow and wanted to know if we saw and heard it. Watch out for poisonous insects in the desert…especially the brown recluse spider. My dogs are city slickers so they are curious about insects and such. My sisters dogs are country dogs and know all about snakes & insects and avoid it. Hello, Rita . . . That post was “The aliens are coming! The aliens are coming!” I’m glad you enjoyed reading it. There were three “aliens” here last night! The only time I’ve seen a brown recluse spider is when we lived in a regular house in GA. The chances of seeing a recluse spider in the desert are rather slim. They are called ‘recluse’ for a reason, preferring dark places to hide in. I had to Google map Ajo… looks like a perfect getaway spot. I’m off to read about it last year. And thanks again Sue for sharing your input on how your setup works! On our countdown, 2013 is going to be our year!! I will be in Ajo in a few months. I’m looking forward to your photos and comments. is there a good RV park in the area? The only info I have right now on RV parks is Belly Acres. It’s the place boondockers go to dump and take on water. The managers are very friendly and helpful. The grounds are neat and clean. It’s not a scenic place but it’s very conveniently located on the main street, near grocery, Family Dollar, auto repair, True Value…. I’ll keep you in mind when I’m in town and will post more information and photos. I am in Ajo and have been staying at Shadow Ridge and it is very nice. Nothing fancy, but very clean and the staff and other resisdents are very helpful. Thanks, Sue and Pat. I will check on both. My location is TN. Have been to Ajo and that area and Organ Pipe Monument is one of my favorite. Went to a trading post while there and bought Prickly Pear Cactus Jelly. Best ever. If you happen to see any let me know and maybe I can order. I’ve tried ordering from a another place. Too sweet, not that good tart flavor. I’ll let you know if I come across any Prickly Pear jelly. I think I saw some in the Nature Discovery Center (or whatever it’s called) in Borrego Springs. I am looking forward to you new photo’s of “lush” desert, I’m afraid I am not a dry desert person. I do so enjoy your site with the pic’s and about you doggies. I have two Chihuahua’s myself, so know about dogs and how they are. Be careful out there and take care of yourself. Chihuahuas are precious. I’ve never considered having one because they are so tiny, I’d probably step on it. Glad you enjoy my blog . . .
What adventures you have had since you last saw Ajo! I bet it almost feels like an old friend welcomiing you home!! Enoy your winter home! Hugs and Snuggles to Bridget and Spike! Yeah, we’ve come full circle. Little did I know what wonderful adventures were ahead for me and the crew when we left here last winter. Great to see you back here, Geri. I’ll assume that means you are getting your strength and energy back. “Outside England ’s Bristol Zoo there is a parking lot for 150 cars and 8 buses. For 25 years, its parking fees were managed by a very pleasant attendant…..The fees for cars ($1.40),for buses (about $7). Then, one day, after 25 solid years of never missing a day of work, he just didn’t show up; so the zoo management called the city council and asked it to send them another parking agent. The council did some research and replied that the parking lot was the zoo’s own responsibility. The zoo advised the council that the attendant was a city employee. This just gave me a huge laugh. I hope you joined me in that. hahahaa! and tax free too! I have to admire the guy’s ingenuity! Quite the entrepreneur . . . Any ticket collector paid by the hour would cringe… Thanks, Joe. Yes, I am at Shadow Ridge. Is your air card signal stronger than last year? I seem to recall that you had some trouble there until you moved up to the Bayfield site. Is Rick around? Hi Mick… The signal is weaker from the spot I’m in, but the antenna makes it stronger than the signal I got last year in the other spot. Re: Rick…. I need to write today’s blog post! Wow, you do have a long way to go! Don’t give up! Congratulations, Virginia, upon find the rig that’s right for you! I hope you have a wonderful year.